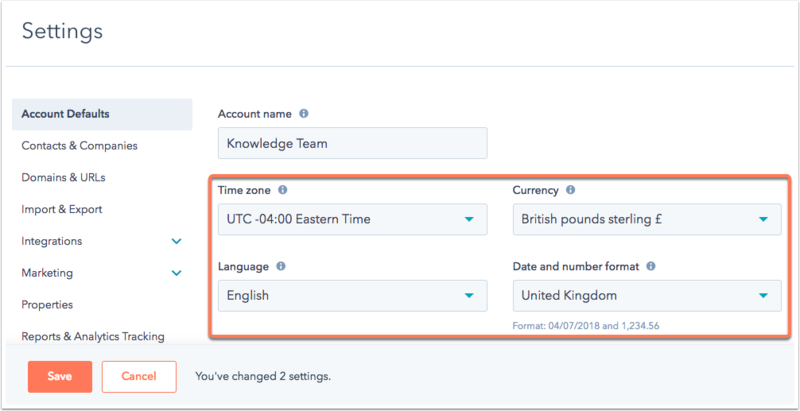 You can customize the time zone, language, currency, and date and number format of your account in HubSpot. If you are an account admin, you can set a default for these settings for all new users in your account. The language and date and number format settings can also be customized on a user-by-user basis. In Account Defaults, click the Time zone dropdown menu and select the time zone for your account. This setting localizes several of your HubSpot tools, including scheduled email sends, scheduled social media messages, and analytics. Click the Currency dropdown menu to select the currency that revenue and deals will appear in in your account. 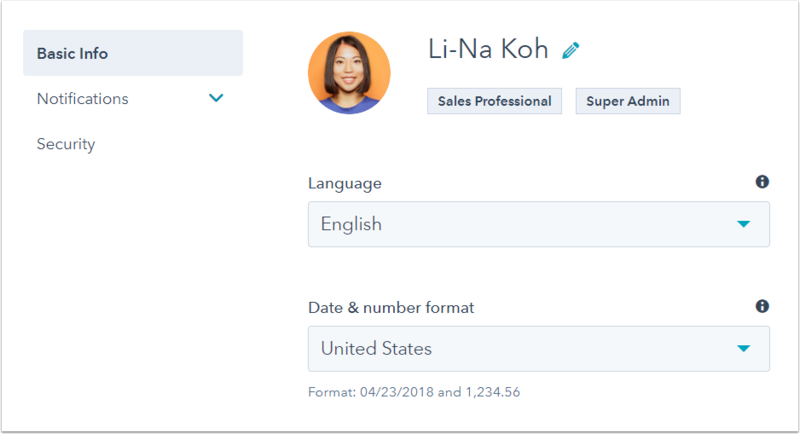 If you are a Super Admin in a Professional or Enterprise account, learn how you can add and manage multiple currencies in HubSpot. Click the Language dropdown menu and select one of the supported languages (English, Brazilian Portuguese, French, German, Japanese, and Spanish). This setting changes the default language of the HubSpot interface. Please note: HubSpot currently only offers phone support in English. Call-back, email, and chat support is available in English, French, German, Japanese, Portuguese and Spanish. To request a call-back in a specific language, ensure that the language is selected for your user. If you change your language to something other than English, your date and number format location will automatically be set based on the selected language. Click the Date & number format dropdown menu to select a different region. Click the Language dropdown menu and select one of the supported languages. HubSpot is currently available in six languages (English, Brazilian Portuguese, French, German, Japanese, and Spanish). Changing this setting allows you to use the HubSpot interface in your preferred language. On mobile, the language in the HubSpot app is based on your iPhone or Android language settings.